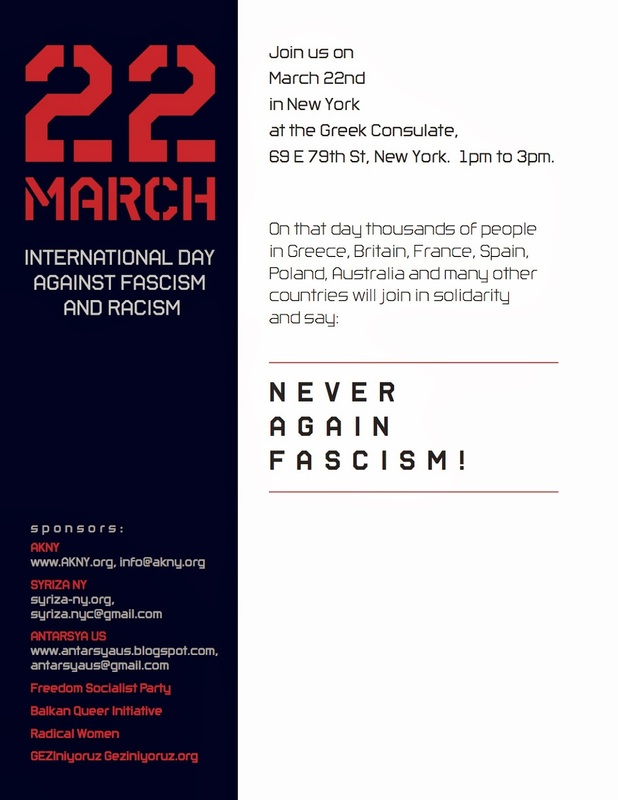 On March 22nd we join thousands of people around the world in Greece, Britain, France, Spain, Poland, Denmark, Belgium, Austria, Cyprus, Australia and elsewhere, in protest against the rise of fascism and racism, state authoritarianism and police violence. In their efforts to suppress any form of opposition, disobedience, and dissent, governments, including the government of Greece, systematically identify and target as terrorists and enemies of the state leftists, anarchist, or immigrants – to mention only a few of the groups of undesirables. In one of his recent infamous statements, Nikos Dendias the Greek Minister of Public Order and Citizen Protection went so far as to connect terrorism with illegal immigration suggesting that though no systemic connection exists between the two, terrorism can benefit from illegal immigration, killing this way two birds with one stone. Death in Greece these days is far from being a figure of speech. In January, during an illegal push-back operation near Farmakonisi, a small island in the southern Aegean not far off the coast of Turkey, twelve people fleeing Syria and Afghanistan drowned after their boat capsized. The survivors’ testimonies about the troublesome role of the Greek coastguard in this most recent tragedy are harrowing. From concentration camps for immigrants to physical violence and death, targeting immigrants and other vulnerable social groups is clearly a government policy in the context of creating a EU-Fortress with the help of Frontex and Dublin II, among other. Anti-crime hysteria, fuelled by government policies and media propaganda, ferments racism and has led to a dangerous resurgence of fascism in Greece. The neo-Nazi Golden Dawn – a self-fashioned popular nationalist organization – which received almost 7% of the national vote in the elections of 2012, is responsible for scores of violent attacks on immigrants, gays and leftists, all documented by Greek anti-racist groups and international organizations such as Doctors of the World. Last year, on September 18, in the working class neighborhood of Keratsini, neo-Nazis ambushed and assassinated Pavlos Fyssas, an anti-fascist rapper and activist who lived and worked in the area. Subject to pressures by the EU and in light of the Greek presidency of the Council of the European Union, Greek police proceeded to arrest the leadership of Golden Dawn. Since then, the government has launched a campaign against ‘terrorism’ and ‘violence’ preemptively arresting protesters and raiding indiscriminately anarchists’ houses while systematically blaming the parties of the Left for instigating violence and civil unrest. As the economic crisis deepens, ultranationalist, anti-immigrant or openly fascist groups and parties such as the GD will flourish. As we are heading for the EU elections in May, polls predict a victory for the center left. Nevertheless, many observers also expect radical nationalist parties to win unprecedented support. Fascism has returned in Europe. Faced with the rising threat of neo-Nazism, a new resistance movement is unfolding and fights with resolve and determination. Join us in PROTEST AGAINST RACISM and FASCISM. On March 22nd at the Greek Consulate, 69 East 79th St, New York. 1 – 3pm. "Whoever does not want to speak of capitalism should be equally silent on fascism." ANTARSYA addresses a message of solidarity to the Ukrainian people who are going through difficult times. The government change brought about in a coup-d’état manner that came after a political conflict with hundreds killed and thousands wounded in Kiev, is the result of a relentless conflict between groups torn by the economic and political oligarchy that has been ransacking the country after the dissolution of the Soviet Union. The root causes of the crisis and conflicts can be found in decades of poverty, along with the attack on social rights and democratic freedoms by the Yanukovych government. At this juncture, we are witnessing a clash between, the nationalist armed militias with a fascist ideology and Nazi origins, on one hand, who are supported and equipped by the EU and the US and, on the other hand, the state repressive forces of Yanukovych’s authoritarian regime supported by Russia. The people of Ukraine find themselves in straitjacket in two imperialisms; That of Russia wanting to preserve by any means its political and economic dominance in the region and that of the EU, with Germany and the U.S. in the leading role, which through the connection with the EU and NATO attempts the annexation of territories, states and economies in the chariot of the European and American capital respectively. 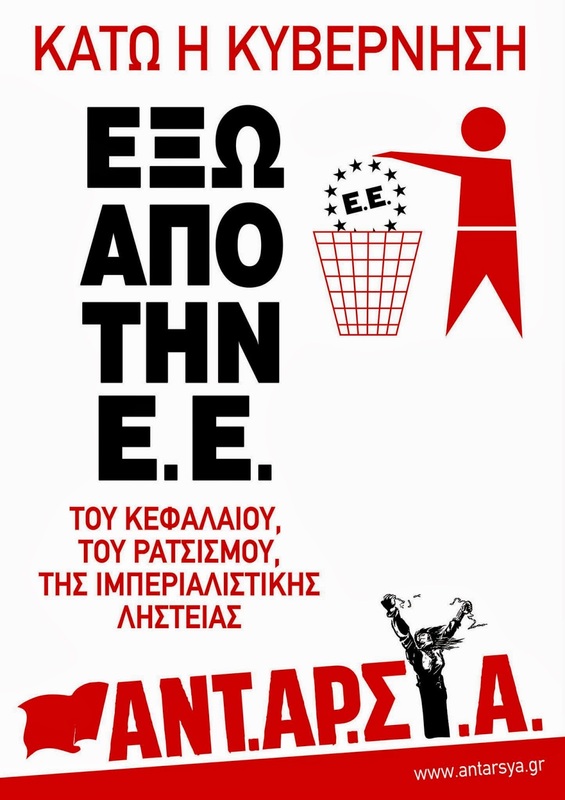 The first coup organized by the EU, spearheaded and led by the fascist extreme right and neo-Nazis forces the masks to drop and proves that the EU not only does not guarantee democracy in Europe, but spearheads its undermining. The first indications from the new Ukrainian regime, as well as the EU/US position point to an attempt at chaining the country in the shackles NATO, IMF and EU-imposed Memoranda, along with attacking the democratic and social rights of the Ukrainian people. "Europeanization" and "reforms" will be nothing more than a new ransacking of Ukraine’s natural resources and wealth that will only benefit local oligarchs, and US and EU capital. This development makes possible the very explosion of civil war, and the division and dissolution of the country. ANTARSYA denounces the reactionary manipulation to outlaw Ukraine’s Communist Party by the EU- and US-supported government. 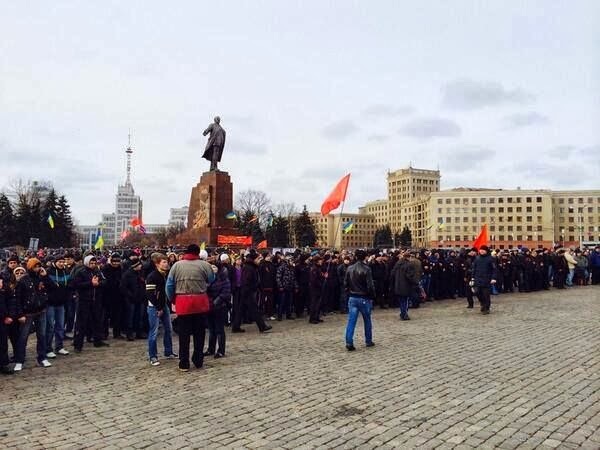 ANTARSYA stands alongside struggling forces, leftists, communists and anti-fascists, who, in difficult circumstances, are trying with toil and selflessness, to bring to the forefront of the battle taking place in the streets, the real problems of the Ukrainian people. Hope lies in the struggle against fascism, against the civil war, imperialist intervention and capitalist ransacking. ANT.AR.SY.A US. Simple theme. Theme images by johnwoodcock. Powered by Blogger.